I purchased this metal sign at a local thrift shop recently. It's a new sign made to look rusted and old. The saying funny but I am going to give it a makeover. First I gave the sign two coats of Fusion Mineral Paint Champlain . Fusion Mineral Paint sticks really well to metal, and seems to hold up well outside. After the sign was dry, I gave the fresh paint a sanding with 220 grit sandpaper. Fusion distresses more like latex paint than chalk paint. Next I pulled out my *Potting Shed Stencil from Old Sign Stencils. 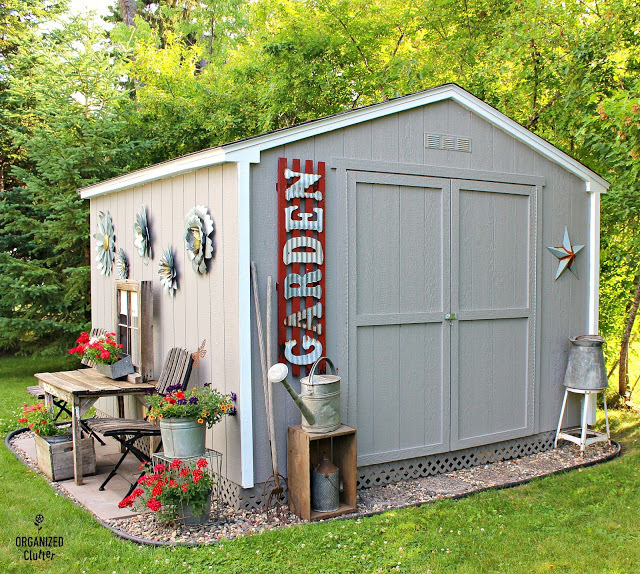 I stenciled on Shed using Ceramcoat Select Multi-Surface Paint in Black . I added the flower on the left to to the left side of my word, using light green craft paint for the stems and leaves and red for the blossoms. I gently sanded the stencils before sealing the sign with two coats of Varathane Water Based Polyurethane in a Matte Finish . Additional poly or spray sealer can be added in subsequent years, unless of course you want the sign to weather and rust. I have a small collection of vintage grass shears. 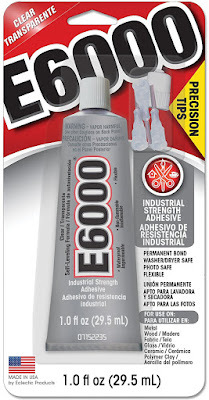 They usually sell for under $5 so I am going to use one for this project. I used E6000 Adhesive to attach the back of the metal sign to the pair of grass shear blades. 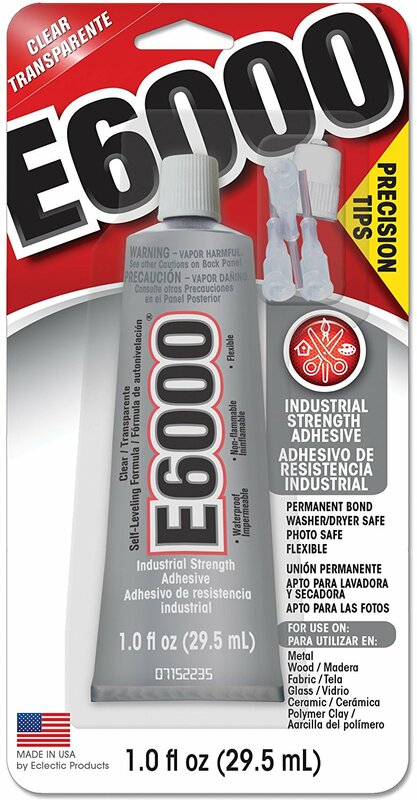 E6000 is a very good adhesive for metal to metal application. I put some weight on glued areas until the glue had set. This will hold up outdoors once properly cured, 24-72 hours. My grass shears had a hanging hole in the underside that I slipped over a nail. 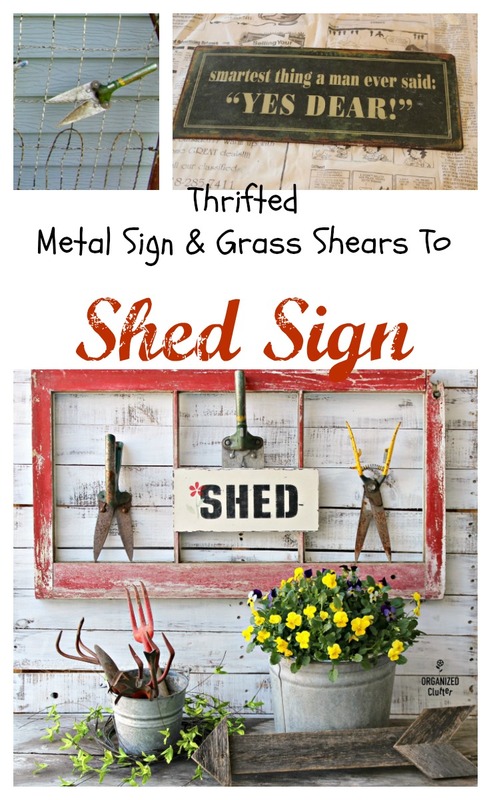 The addition of the grass shears adds fun to the plain little shed sign. 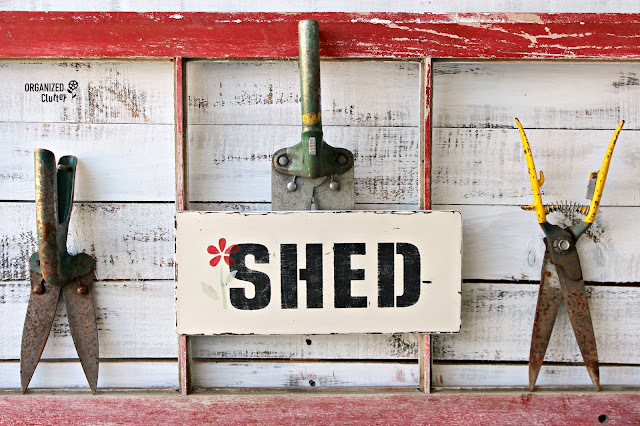 I will be hanging the sign on my garden shed this summer! But until it's warmer, I will stage my new grass shears/shed sign with my newly purchased basket of violas from Menards! The garden shops will open the first week of May. Love this! What a great idea adding the sign to the garden shears! 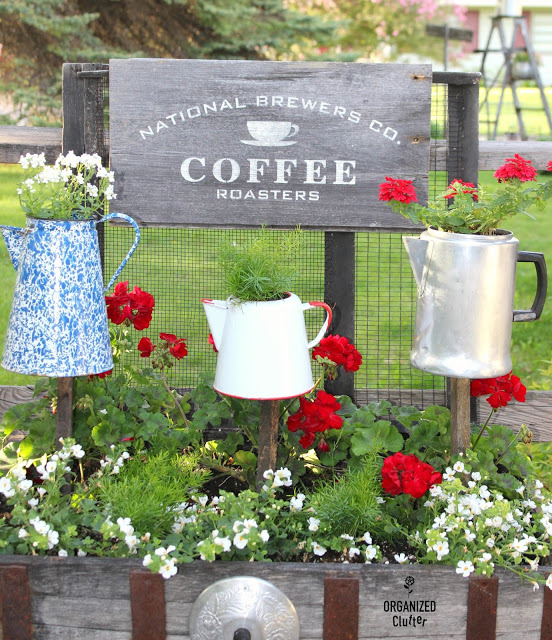 Love all your garden displays!! Positively beautiful and such warm character. Love this display! you always come up with the cleverest ideas. so cool. 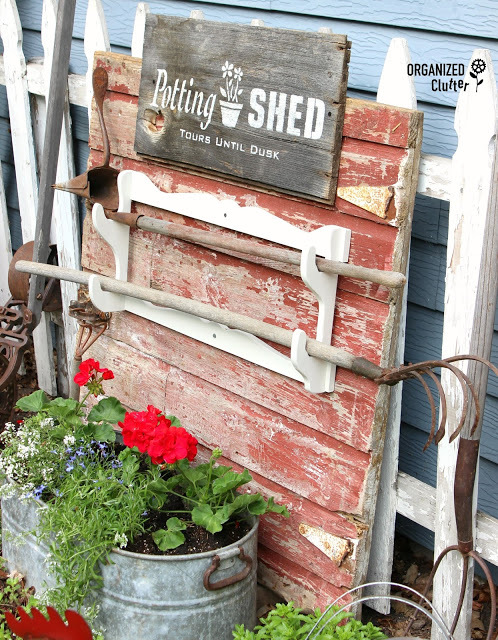 Your garden vignettes are all beautiful and interesting. 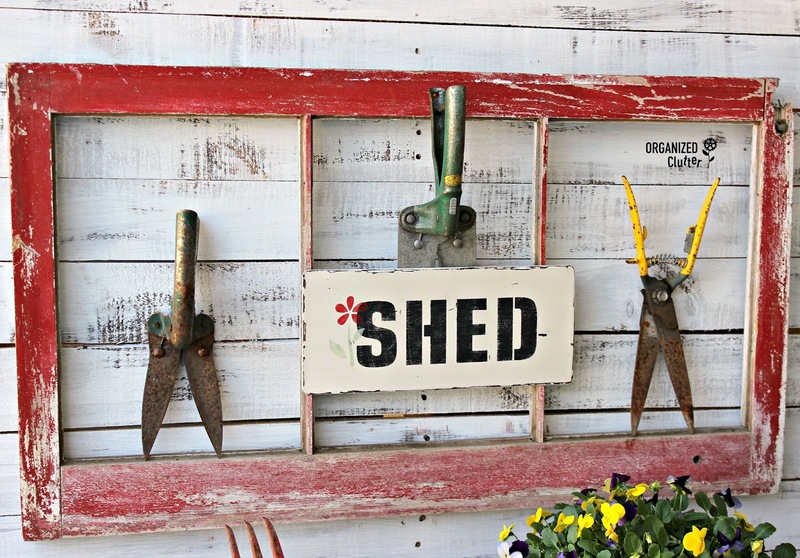 I like the idea of using the garden shears to hang your SHED sign. 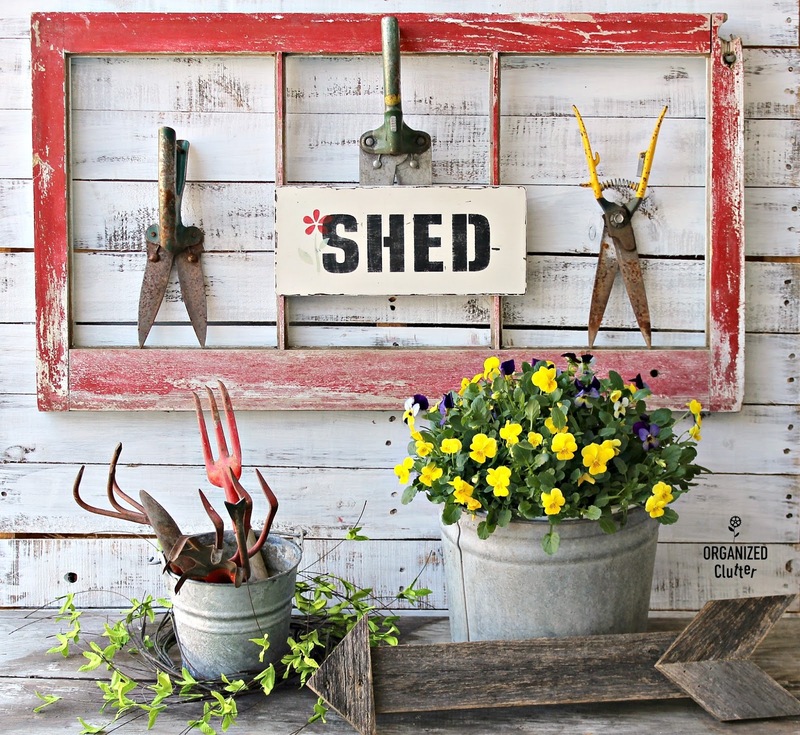 I can hardly wait to get outside and start planting and digging in the good old earth! Our spring is so late this year that I am chomping at the bit. I hope to get working in my gardens soon! It’s been a long winter! Thanks! 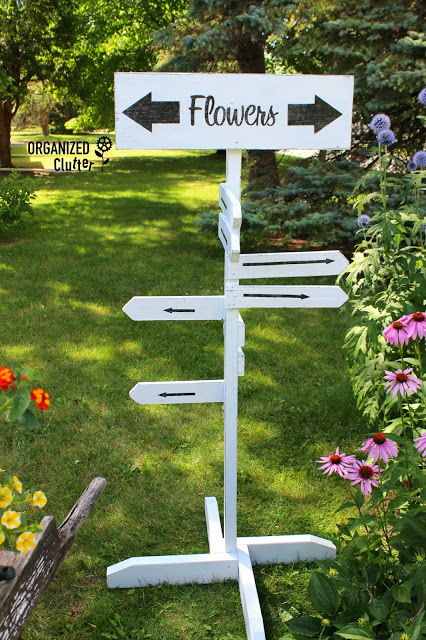 I just LOVE how you mounted this sign! Themed so perfectly and genius! 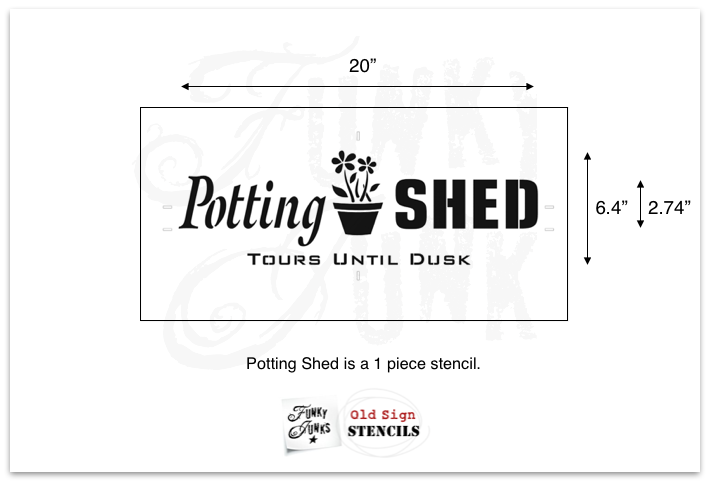 I can't wait to see this up on your shed! Adore your fresh take on things Carlene!